Here is the Wine Cellar gate again with some rockwork and bridges. If you look on the left you will see the latch which is connected mechanically by pushrod that is just visible on the right end of the latch. The rod goes through the fascia and connects to a switch that controls the power. I love your Wine Cellar gate. It looks well constructed and very nicely scenicked. How does it open? Is it part of the door, or open seperately? Ralph thanks for all of your pictures. I will be redoing my layout as well in a few years, and I already have picked up some great hints. Ralph, looks like you are off to a great start, I'll be following along. Hey Ralph,I just discovered this thread. Great background story, kinda sounds like my house with daughters here instead. This must be a very exciting time for you now! And you seem to be off to a great start. The wine cellar gate looks really great! I think you have the wrong backdrop though, shouldn't you have a vineyard in the distance behind your bridge? Best of luck on this new layout! Greg, I was experimenting with printing some pictures. 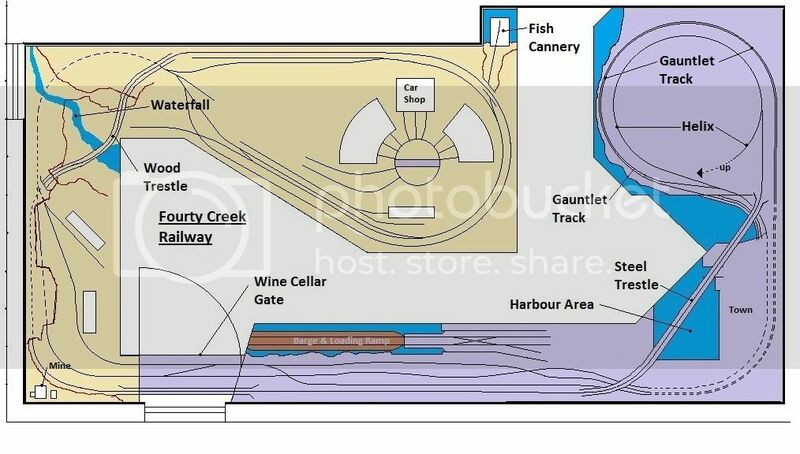 Here is the Plan of The Fourty Creek Railway. I did this with MS Paint which I'm very familiar with. I like that idea about the vineyard. Now i'll just have to find a picture of a mountain vineyard. I have to get Chris Lyon involved maybe he can come up with some thing for me. In one of the past issues of Modelrailroader and Craftsman they published some photos that inspired me. Here is the one that was in MR in the trackside photos. 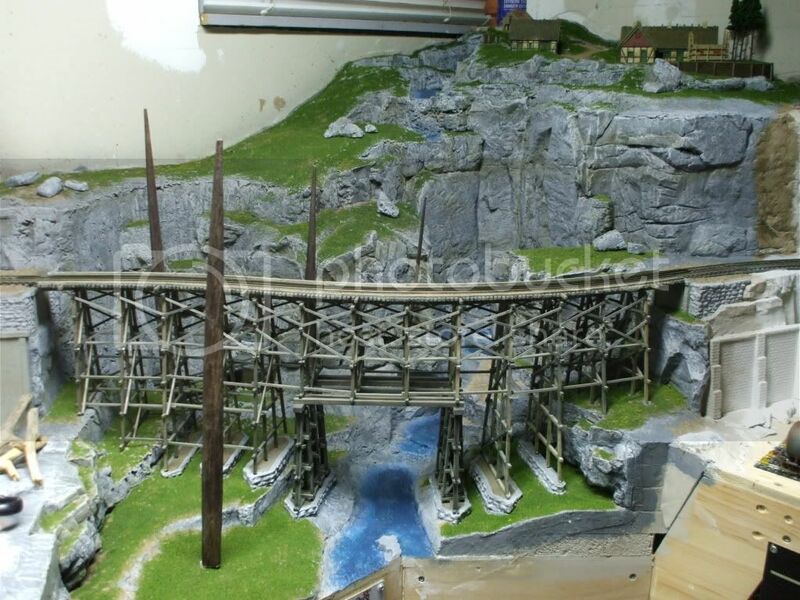 I love waterfalls and bridges so I'm trying to create a waterfall something like this and I have a scratch built wooden trestle to pass in front of the waterfall. Here is the photo that appeared in Craftsman in an article about lake barges in British Columbia. 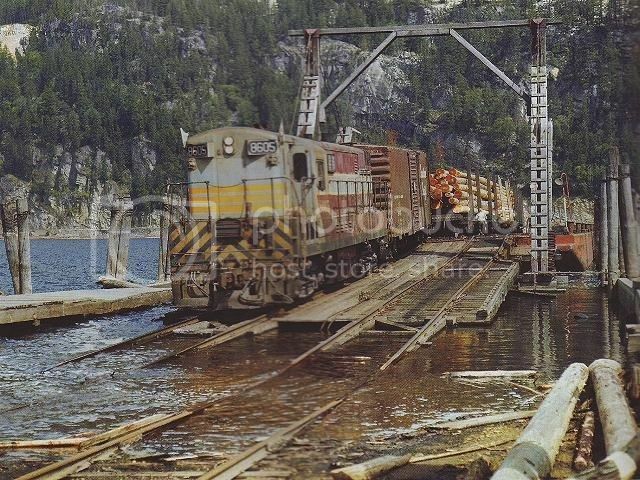 The article photo shows what looks like a CP Traimaster on the barge but had to run through water to get there, The tracks are submerged at the bottom of the loading ramp. Two major projects that I think I can pull off. 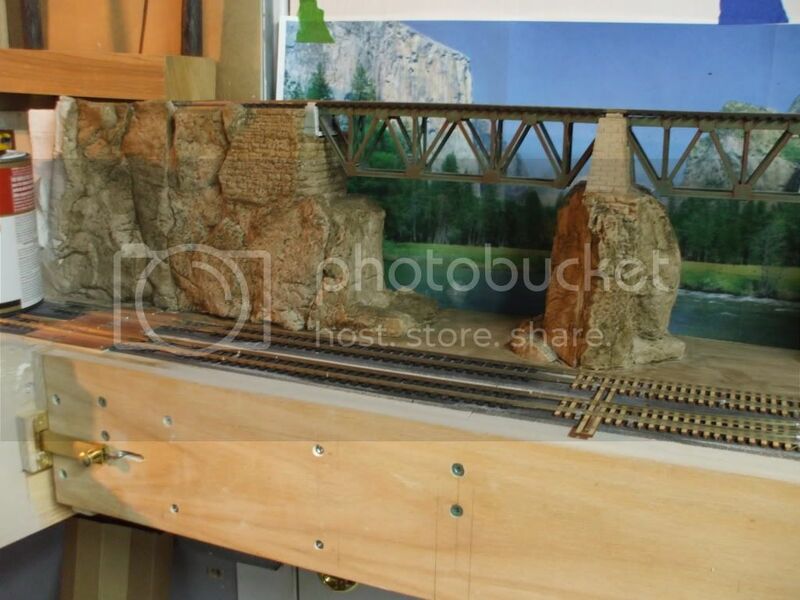 The rails in the water will have to be altered so that the water level only comes up to the bottom of the rails maybe a tad higher, enough to clear the wheel flanges. 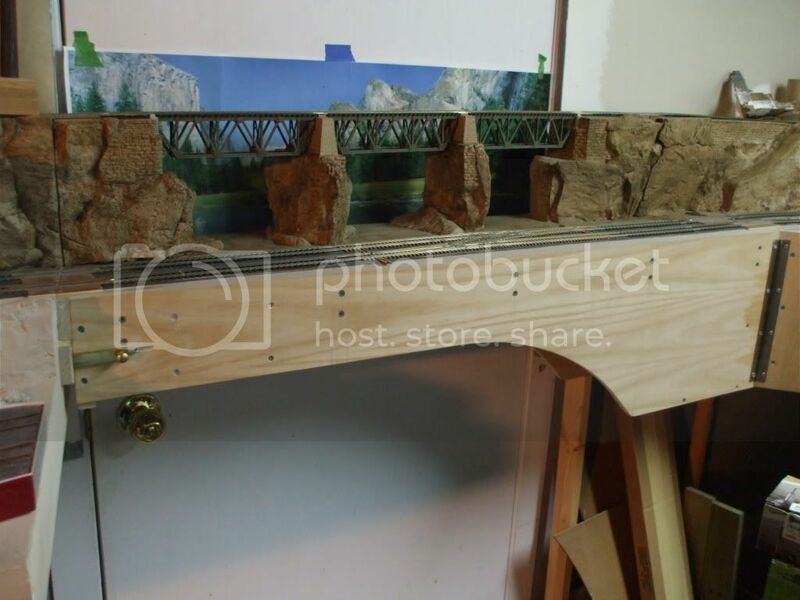 My waterfall is going to drop about 16" to the riverbed below and I have already completed the trestle, it's an 'S' shape and about 24" long. In the next series of pictures I will show both. 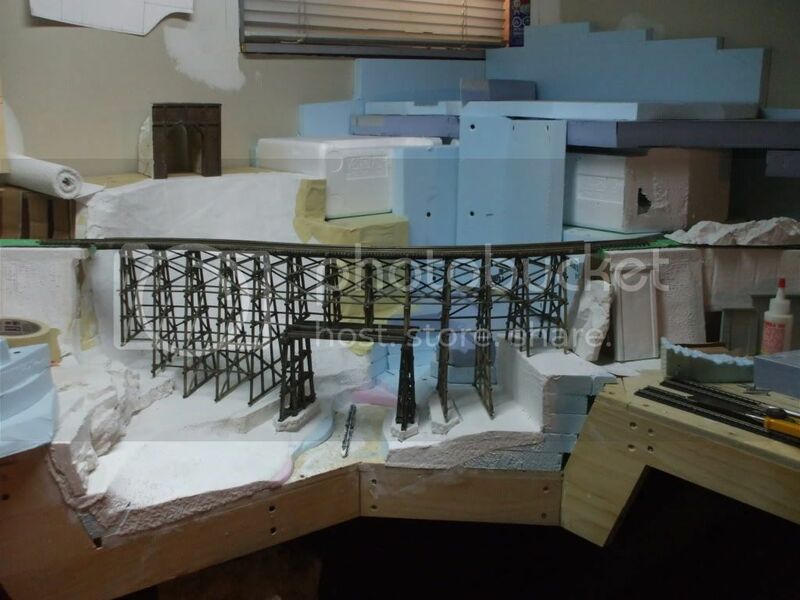 I have the waterfall and trestle almost done so I can show you a series of progression shots. This is in the NW corner of the room so there was not much that could be done to the walls because of the window. The north wall is our sauna and the west wall where the two meet has a window so my aim here was to take your eye away from the window. 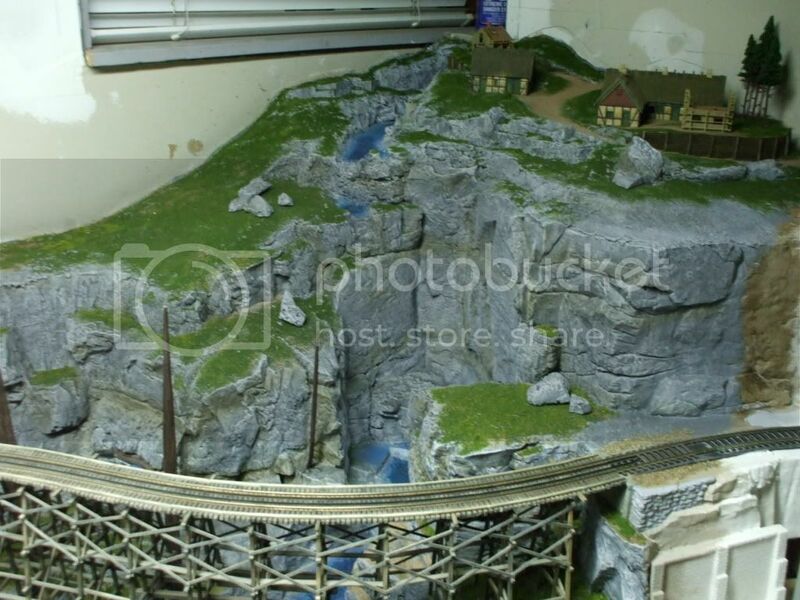 I think the waterfall and trestle will do that just fine. Building in Styrofoam is amazing it is so lightweight and durable. The method I chose you may not be able to tell the exact method from the pictures so let me tell you my technique. During the trial and error stage I use drywall screws to hold it together and once I have determined the final positioning I use a product called "No More Nails". Don't use carpenters glue, I found that when I was taking the old layout apart that there were some areas that I glued with Carpenters glue that were still wet after 10 years. No More Nails seems to cure solid in a much shorter time. Once I have the basic shape I want I cover it with plaster cloth and then Sculpt-a-Mold if required for added texture where I 'm not using rock molds. I do my rock molds like a jigsaw puzzle, the only difference is, I'm making the pieces and trimming them to fit. I mount the pieces with drywall mud or compound and fill the gaps with it as well. I also added an N scale Danish farm scene, I had to do this, my wife is Danish. What a conbo eh! Danish and Italian and thanks to her heritage I got to meet Troels, his lovely wife and Tango the great dane. Oh yea! 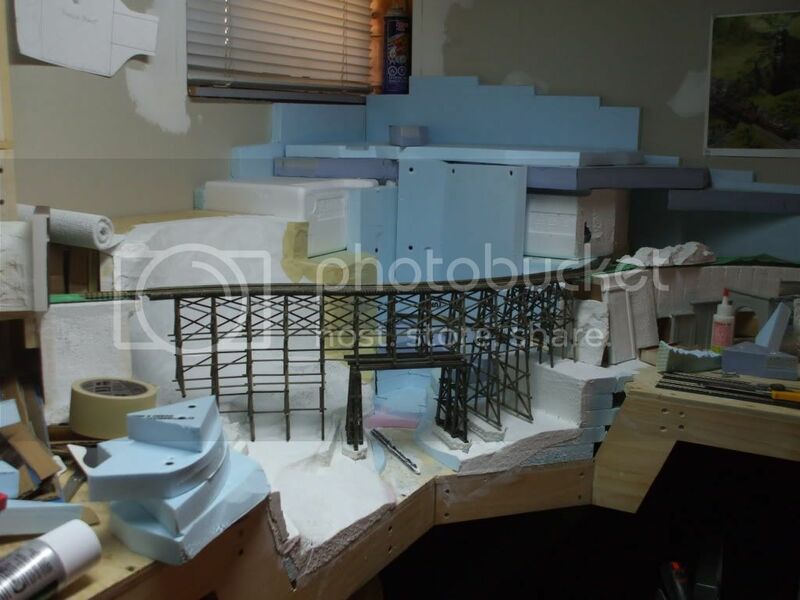 and see his amazing layout. Someone told me a long time ago that when you build your layout don't keep moving aong leaving everything white, sooner or later you will get discouraged and think it will never end. If you do some scenery as you go it won't be so overwhelming.So this is how it looks now, it's not finished but at least it not all white. Ralph, your rock work is amazing! That will be a very dramatic scene when finished. And that trestle is gorgeous! Hey guys, I added a YouTube link to the post at the top of the page showing the gate in action. In case you missed it here it is again. Sorry I was trying to post it from photobucket but it didn't work so I sent it to YouTube. Here is a link to a Quick Tour of The Fourty Creek. 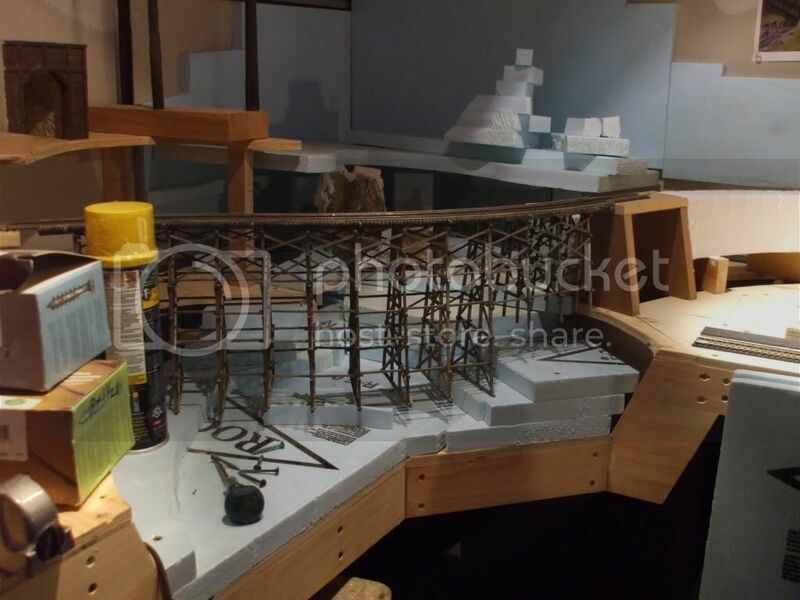 The benchwork is open frame with 1/2" ply where necessary like the yard and engine facility, the lower section of the waterfall and the barge ramp. 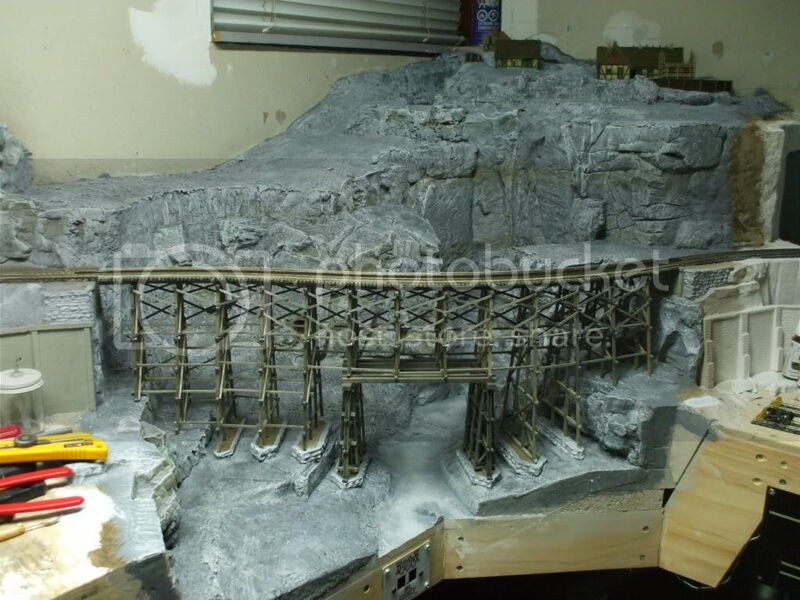 I used the 2% Woodland Scenics risers starting at the waterfall end of the engine facility yard, circling around the engine facility and back towards the waterfall, under the hydro panel, across the wine cellar door bridge and over toward the barge area. By the time the rising track got to the barge side of the room it was about 10" high. For the rail barge I took a tip out of Troels book and made it out of blue styrofoam and covered the sides with styrene plastic and added an 1/8" wood deck so I could fasten the rails. Hi Ralph,your track plan looks interesting and real professional by using MS Paint. 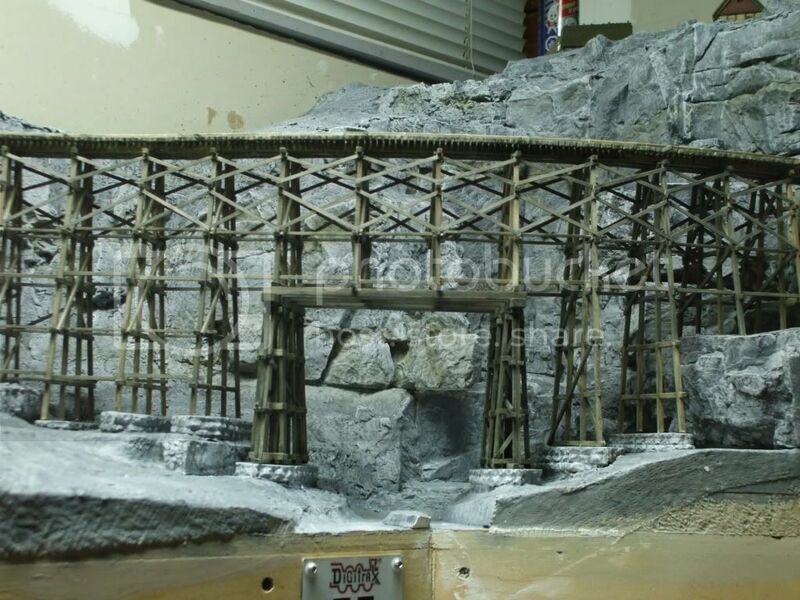 The trestle already looks impressive and your rock scenery is excellent! With the amount of work you have accomplished already, you can tell you are really on a mission! Hi Ralph. 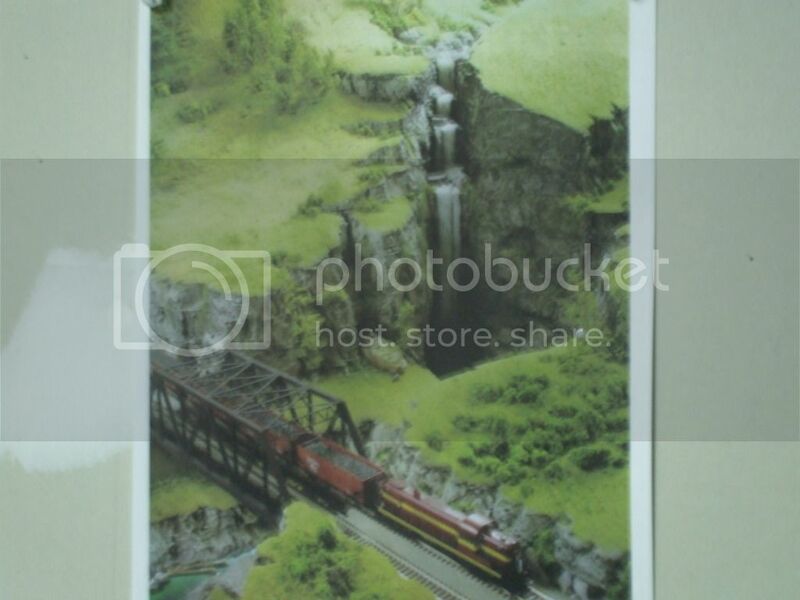 Nice to see your photos of the Forty Creek RR. Great story and I will be following the progress. I'm intrigued - I have seen that picture before in RMC, but have only ever seen it in Black & White - thanks for posting.